UPDATE March 2015: I wrote this post at a time when all these tips were accurate. Pinterest has changed a bit since then (hello algorithm! but many of these tips are still good ones). I'll be updating this soon with a few more tips in a new post. Stay tuned. But my most important new tip: Be really specific in your description when you pin because people are using Pinterest like Google these days. So don't just write, "New cute zippered pouch." Instead be sure to write the name of your shop and a good description of the product (along with a bit of a story like I share below). I really want to use Pinterest for good. I believe that Pinterest is becoming a game changer for Etsy shops. Most articles I've read about what people are pinning indicate that Etsy is one of the top five (usually in the top two) sites people pin from. For the last year, I've been actively using Pinterest to promote my Etsy shop and my business has doubled. With that in mind, here are a few things I really want you to know. Note: I've written this assuming you are an Etsy seller who has a pretty good understanding of how Etsy works. If you are new to Etsy, you will have to explore the seller features and play a bit to understand all these tips. 1) So this one applies to almost all small businesses who are pinning business-related things to Pinterest. You really want click throughs more than you want repins. Click throughs = sales. Repins = people who think your product is pretty enough to repin or it inspires them in some way and they want to remember it. What this means: Keeping this in mind will help you learn more about how Pinterest is or is not working for your business. Think about the way you use Pinterest. You might revisit DIY or recipe pins. But when it comes to a product, do you scroll through all your jewelry pins to find that one bird necklace you pinned a year ago? Or do you impulse buy when you LOVE something or see the perfect gift for someone? Bottomline: Your photo + description on Pinterest need to tell enough of a story that you get people to click. Repins are good. It gets your item out to more people. But we really want people to click through. For most small businesses, getting our products in front of people with a clear way for them to purchase is more important than name recognition alone. Name recognition is good for bigger stores and brands, like Pottery Barn or Nordstrom. We want the click throughs. 2) Sometimes the image that gets people's attention on Etsy might not be the same one that gets their attention on Pinterest. When they are on Etsy, they might already be in a buying mood or are searching for something specific, so unique photos work because they are already looking at "necklaces with big beads" or "zippered pouches" etc. On Pinterest, they are more likely to be looking for inspiration (or passing the time). What this means: Can people tell what your item is when they are just looking at the first photo without any context? (The first photo is more than likely going to be the one pinned. *) If not, they might scroll right by it on Pinterest. If your item is a necklace, you want people to be able to see that. If your item is a card, make this clear BUT also be sure they can see your gorgeous artwork so they will click through to see more. If they can just tell it is a card, they might not click through unless they are searching for a card. Most people aren't searching for specific products on Pinterest. Bottomline: Consider experimenting with different types of photos - close-ups, unique angles, clear full product shots - and see what happens when you pin them. *When pinning your own item, you can actually upload any product photo to Pinterest and then route the URL to the product page on Etsy. You have to first upload + write the description + pin. Then go back and edit the pin and add your product's URL. 3) When you pin your own items, be sure to add a description that explains what your item in and tells enough of a story that people will click through (see #1). But when you pin from Etsy, the default text in the description will be the title of your product plus your shop name and the price. *I'm not recommending you change the names of your products! In fact, if your items are already on Pinterest, you won't want to change them after reading #5. Just keep this in mind when you are creating new collections/adding new things to your shop. 4) When pinning your own products to Pinterest (which is a good idea! ), spread out the pins. Consider one in the morning and one in the evening. Pin a variety of products. Or once a day at varying times throughout the week. Consider creating a board just for your products. And feel free to pin the same item again to the same board because your followers change and people need to be reminded or the item goes on sale or you just have one left etc. Just spread out the pins! What this means: Think about it. When you pin five items (or more) from your shop at once (or the same item at the same time every day), you are kind of spamming your followers with a lot of the same thing in their feed. You wouldn't do this on Facebook, for example, so avoid it on Pinterest too. Bottomline: People are on Pinterest throughout the day, but especially in the morning, late afternoon, and evening. You will get different people looking at your items if you vary your pinning. And you will avoid people unfollowing you because you pin too much of your own stuff at one time. 5) Pinterest now sends out notifications when something you've pinned goes on sale. I don't know if this is in every instance, but it is happening. My guess is that they are working with a handful (maybe a large handful) of companies, but Etsy is for sure one of them. What this means: I've been putting one item on sale each weekend for a few weeks now. When I do this, at least some people who have pinned this item receive an email from Pinterest letting them know that the item they pinned is now on sale. The email takes them to the pin. I'm still experimenting to see how many people are buying, but this is a really interesting new feature to me, especially going into the holidays. UPDATE 6/2/14: It has been a while since I've received one of these sale emails from Pinterest, so I don't know if they are still doing this. Here's what I recommend: Do what works for your shop. If add "sale" to the name helps people find your sale items, do that. I think tagging your items with "sale" is a good idea too (when they are on sale). Pinterest tries new features out all the time and this one might be one they did for awhile but aren't doing anymore. 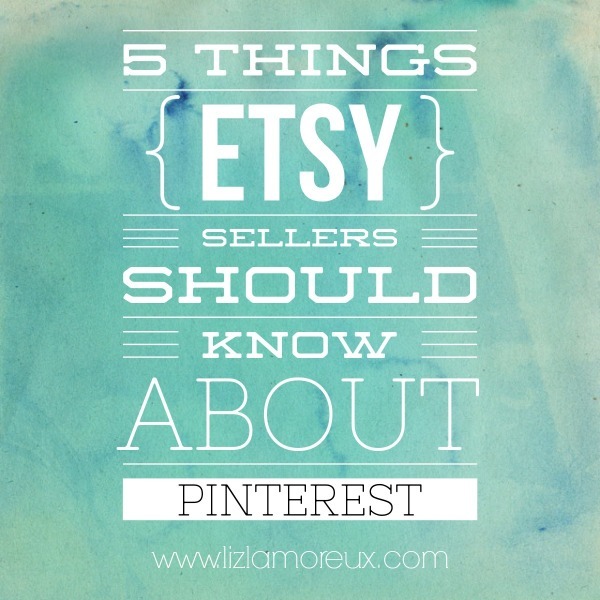 +1) And one awesome way that Etsy sellers could use Pinterest for good. Etsy sellers (and others who have small businesses on other sites) could come together to support one another on Pinterest. Consider gathering a group of friends who all have Etsy shops and commit to sharing each other's work with your Pinterest followers. Let your friends know what items you want to highlight this holiday season. Work together to spread the word that buying handmade is a very good thing. In the comments: Feel free to share how you are using Pinterest with your business. If you are an Etsy seller and have had other experiences, please let us know! These are my observations and I'd love to pool our knowledge. And if you have any questions about Pinterest, I'll try to answer them in a future post.